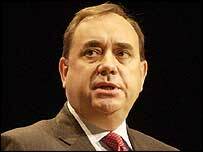 SNP leader Alex Salmond has challenged the prime minister to a debate about the future of Scotland. It follows attacks on the Nationalists from Tony Blair in Edinburgh on Friday. Mr Blair said he wanted to go "head to head" with the SNP on independence and the future of Scotland in the run up to the 2007 Holyrood elections. Mr Salmond said: "If Mr Blair wants a head to head debate then I am more than happy to have one." He called on Mr Blair to name the time and place. "Then we can give the people of Scotland an opportunity to see exactly why the SNP is the only party that puts the interests of Scotland first," he said.